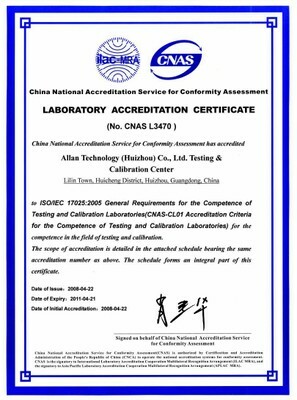 Allan Technology (Huizhou) Co., Ltd. , a subsidiary of Allan International, have been granted China National Accreditation Service for Conformity Assessment (CNAS) accredited laboratory status in April 2008. CNAS is the national accreditation body of China responsible for the accreditation of certification bodies, laboratories and inspection bodies. CNAS is established under the approval of the Certification and Accreditation Administration of the People’s Republic of China (CNCA) and authorized by CNCA in accordance with the Regulations of the People’s Republic of China on Certification and Accreditation. This certification reflects our total commitment to our business and will be instrumental in our future technology developments. © 2017 Allan International Holdings Limited. All Rights Reserved.